A little over a year ago I wrote about how I'd been using a Mac as my main work machine. I hadn't written anything on the subject since. Here are four useful Mac programs that I can recommend to people. Sizeup, from Irradiated Software. A bit Like Windows' aero snap, but on steroids. I love this. I regularly move windows between two desktops (external and internal display), resize and centre them or put them in one quarter of the screen with just a few presses. The "snapback" feature is also great. X Lossless Decoder (XLD). A handy transcoder that can use QuickTime encoders and so can write out Apple/Quicktime/iTunes-encoded AAC/MP4 files en-mass, translating file meta-data. 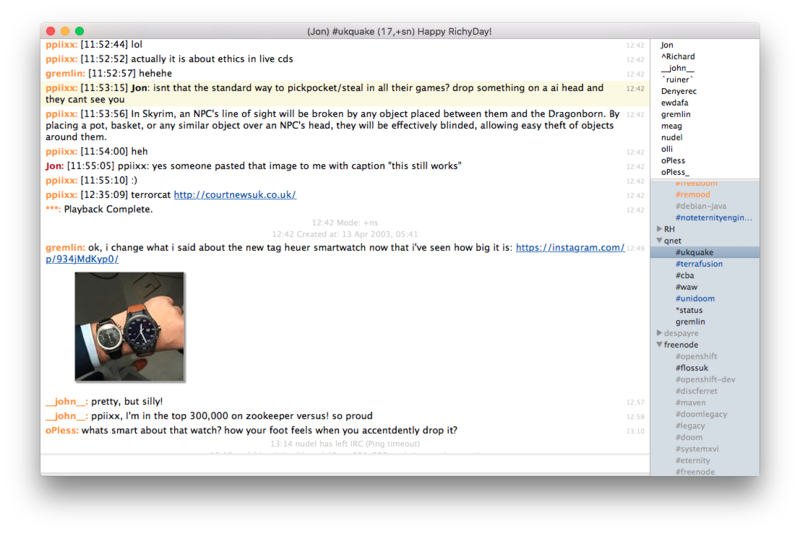 LimeChat, an IRC client. I theme it to look like Colloquy. The net result is pretty clean. I like using a proportional-font for text things, so getting IRC out of a terminal is a win for me. LimeChat automatically fetches and thumbnails URIs to images that people paste in channels, which is either incredibly convenient or a curse, depending on the channel. You can toggle that behaviour but only across the whole client, not on a channel or network basis. Finally, 1Password is an incredibly slick password manager. I use it in a very basic fashion: no mobile client, no syncing to anything outside of my workstation. You could also use LastPass which is similar and has a Linux client. I haven't tried it, but there's a third party tool to read 1Password password stores on Linux written by Ryan Coleman of SDL fame called 1pass. 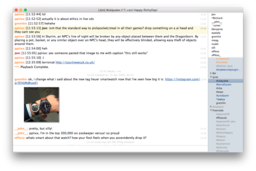 After a "long" search for IRC I came to Textual, obtained free/gratis during a promotional period. I suggest you to register on AppShopper.com, then choose and set ad "i want this" for every app you're interested in. When they do a discount price, or are given free, you'll be warned immediately with an email.